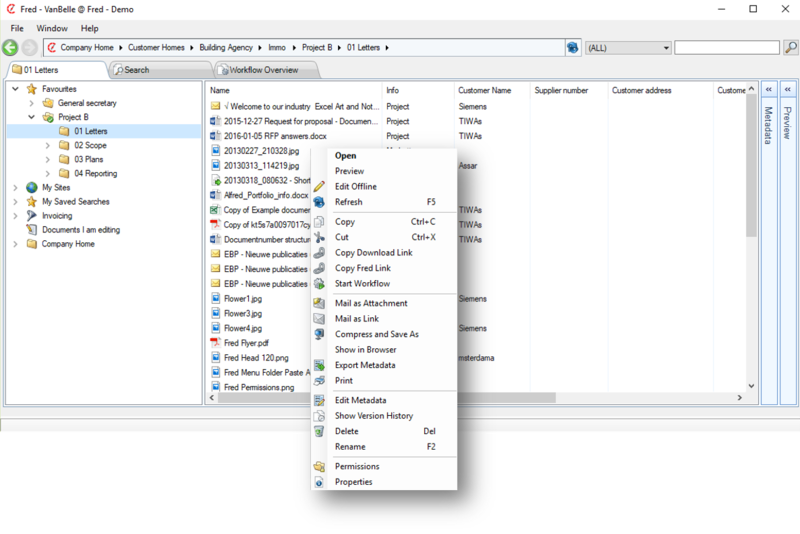 Right clicking on a folder in the navigation pane, or the white space in the Details pane, pops-up a command menu, enabling you to manage the folder structure. If you do not hold the appropriate rights to execute one of these commands, the command will be disabled. 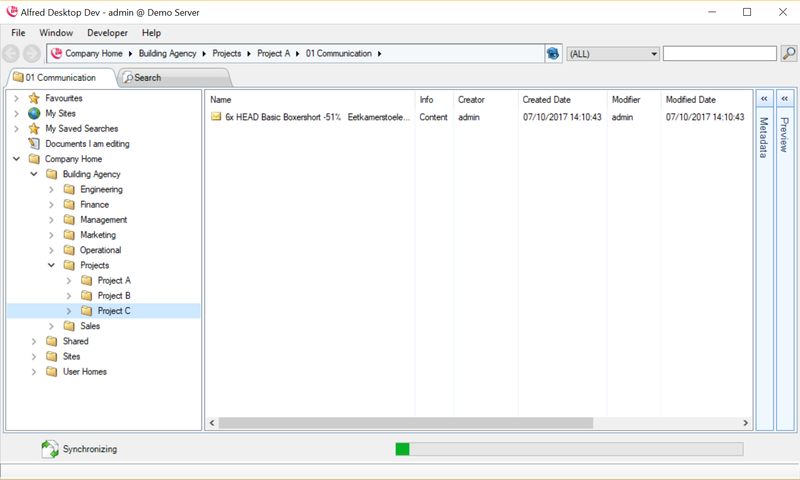 When opening a folder for the first time (or after a certain time span), Alfred Desktop will query the Alfresco repository and present the contents of the folder. When another user is concurrently adding or editing content in the same folder, updates are only presented in your Alfred Desktop window when you force (by using the F5 key or through the menu) a refresh of the folder content or, after a certain time span, when the folder is reopened. This will: update the subfolder list, the list of files and its meta-data in the Details pane. To create a new subfolder, click “New Folder”. Enter the name of the new folder and press the Enter key. Or select one of the Template folder structures and input the name of the top folder. When using a folder template to create a new folder, you will automatically copy all smart behavior functionality (such as rules, scripts, etc.) configured in the folder template. Contact your system administrator for more information or if you require assistance to amend the smart behavior functionality. The ability to create a new folder is not available for any Share Sites folders, as this is a part of the repository that needs to be set-up through the Alfresco Share interface. You can, however, create content in the Share Site document library, as it is a normal folder. To rename a new subfolder, click “Rename”. Enter the new name of the folder and press the Enter key. 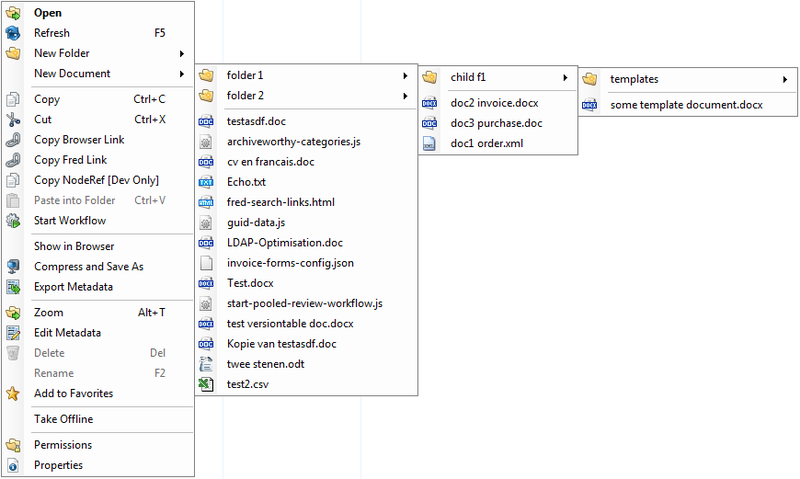 By simply using the drag and drop function, you can move one or more folders to any location in the tree. You can move folders within the Navigation pane or you can move folders from the Detailed pane to the Navigation pane. You will be prompted to confirm you want to move the folders. Note that you need the appropriate rights to execute a move. You will need, at a minimum, folder creation rights in the receiving folder and folder deletion rights in the original parent folder. To delete a folder, click Delete . You will be able to restore the folder by clicking on the Window / Recycle Bin option. See Recycle bin. You can copy a link, containing a folder address, to an email or a document. 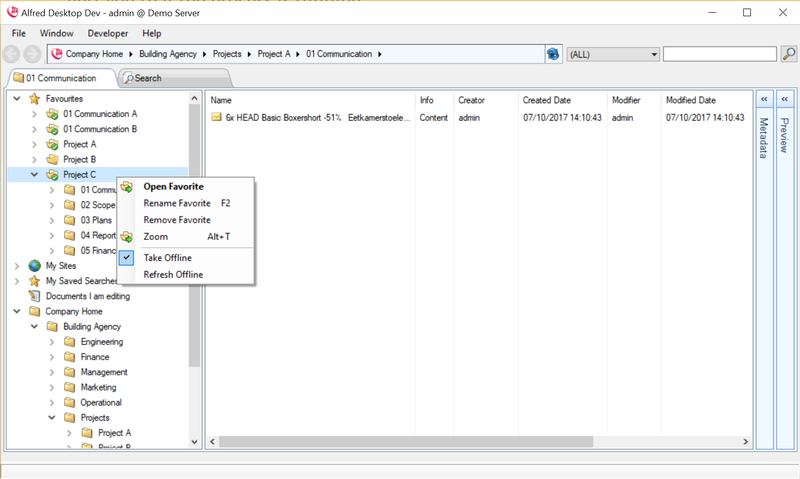 Provided the receiving party has access rights, clicking the link will open the Alfresco browser and display the folder and its content. 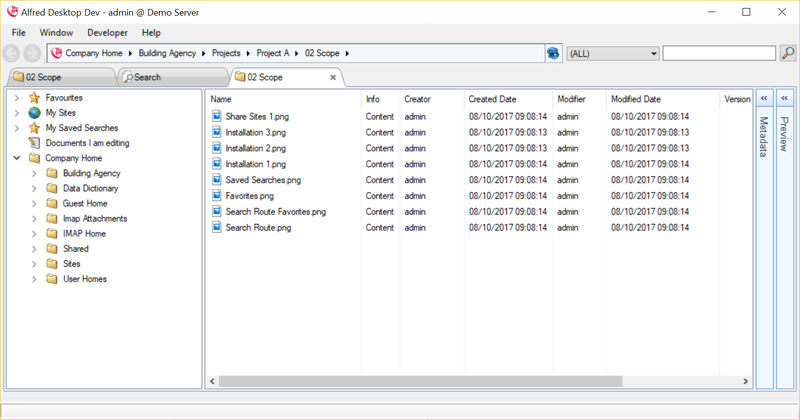 This copies a link that will open the Alfred Desktop application and show the content of the folder in the Details pane. 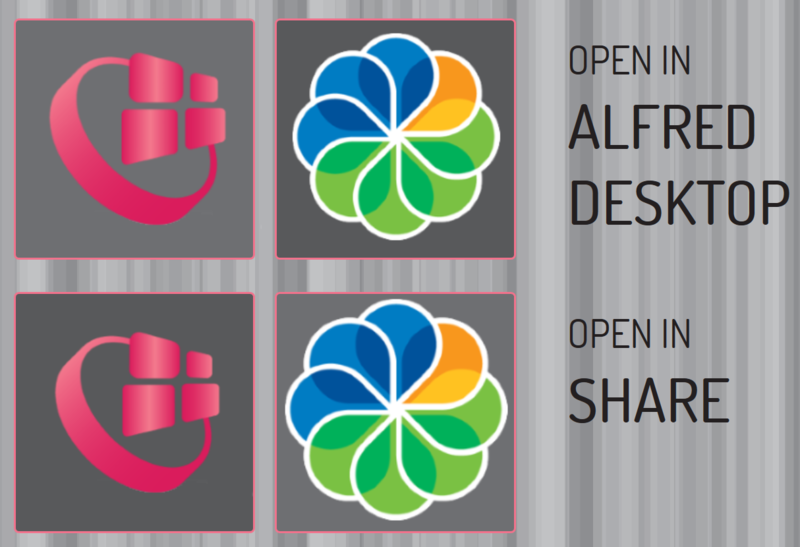 People that do not have Alfred Desktop installed will be directed to the Alfresco Share web user interface. You can add the Alfred Desktop link as a hyperlink into a document or an e-mail by selecting the Mailbox option, and pasting the Alfred Desktop link. 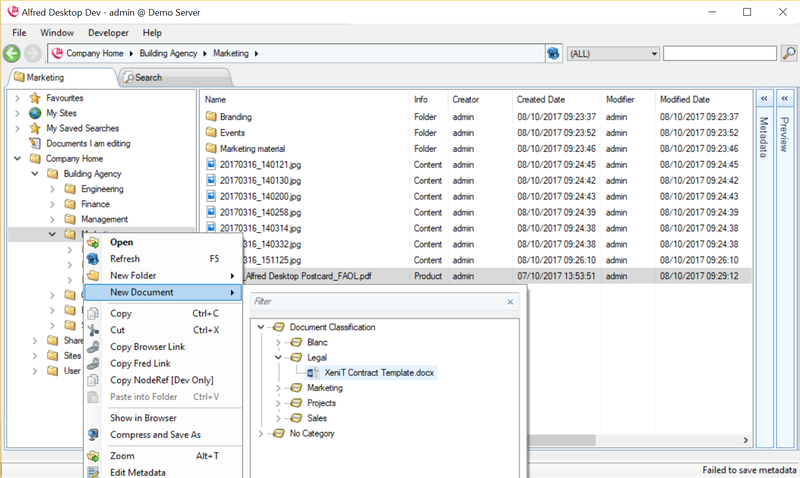 “New Document” will allow you to create a new document in Alfred Desktop from templates previously defined on the Alfresco server. An Administrator, or a user with the appropriate rights, can add a new template documents to a server. Once a template document is added to the folder Company Home / Data Dictionary / Document templates, it becomes available to all users. You can set document type and metadata values for templates. The documents created from a template will automatically inherit the template’s document type and metadata. 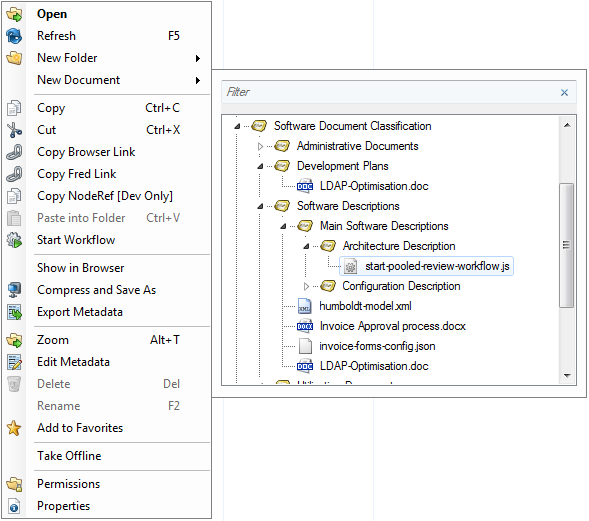 The template documents can be set in a folder structure. 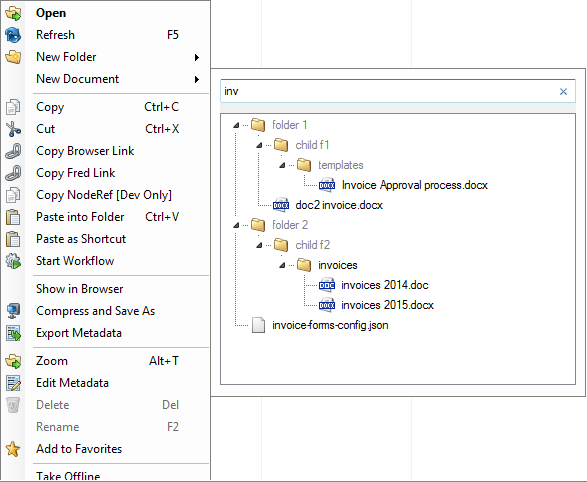 The folder structure will be represented as a navigation tree in the document template picker. The difference with the previous option is the presentation form and the filter. When tapping keywords in the filter, the folder tree will be filtered to those document templates matching the keyword in the filter. When typing a keyword in the filter, the category list is filtered to those categories that fit the keyword. The Show in Browser command enables you to jump from Alfred Desktop to the Alfresco Share interface. This enables you to view more folder details and use all Alfresco functionality available through the Share interface. You can select one or multiple documents and print them using the default printer configured on your local PC. When you copy a file from your desktop, this command will be enabled. You will be able to paste the file (using either CTRL V or Paste into Folder) into the selected folder. Cloning the document into the same folder will create a ‘document_name –Copy.docx’. Cloning it into another folder creates a ‘document_name.docx’. Note that in the Info Column, the file is indicated as ‘File Link Object’. If you want to see the details of the document, double clicking the file will make it jump to the folder in which the document is located and display the metadata details. This function is only available for those folders where the user has access entitlements beyond consumer rights. By clicking “Permissions” on the folder menu, a new tab will open and display the user and group rights set for this folder. The table indicates: which rights are set for which users, if the user received the right through that group, and / or if the rights were inherited from a parent folder, and the Authority Type. 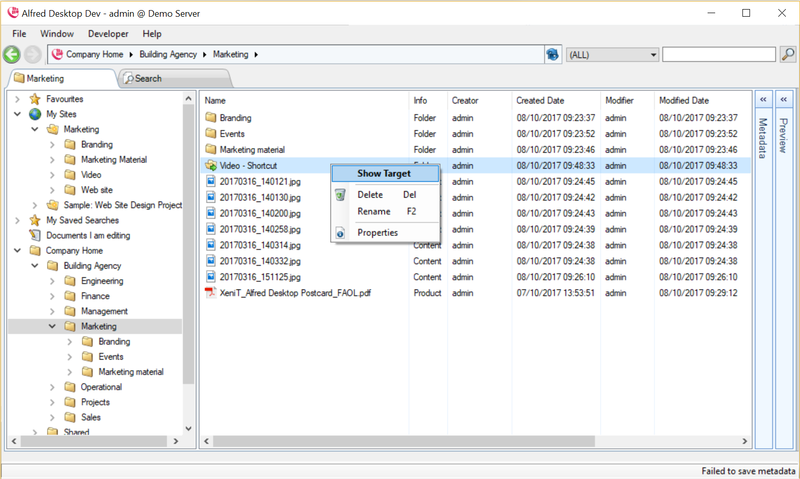 The upper part of the screen shows the permissions that are inherited from the parent folders up to the company home folder. The lower part of the screen shows the permissions that are set on the selected folder. Permissions are set for users or groups. 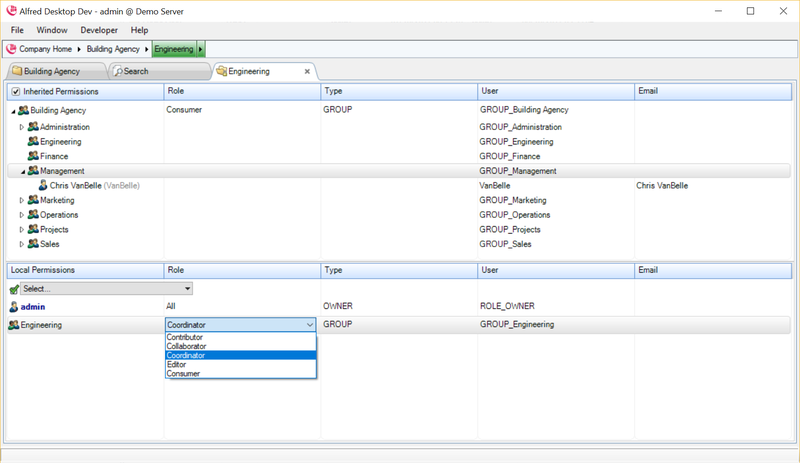 Selecting a user or group will highlight (in green) in the breadcrumb the folder in which the permissions are set. You can click on the folders in the path to see how the rights are set in the folders above. You can set permissions for users or groups in the Local Permissions section. Click into the cell if you want to add a user. Type a name, and the list of the matching users or groups is displayed. Select a user or group to add them to the local permissions. 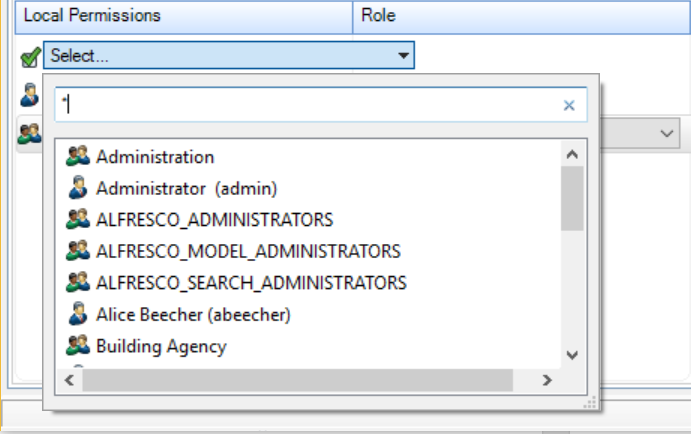 That name is now listed in the local permissions table and you can define the role. If you don’t want a user or group to have access to the folder anymore, right click on the user’s or group’s name and select “Remove permission”. You can select multiple folders in the Details pane. Some commands in the folder menu are unavailable when you select multiple folders. You can take part of your repository offline. In the offline mode, you are able to navigate through your offline structure, view the related metadata, and open the documents you have selected to take offline. While the folders are synchronizing, a message at the bottom of the screen will alert you that the process is running. When completed, the folder is visible under the Favorite folder and is marked with a . When you are online, you can refresh the offline content with the newest content available on the server. Alfred Desktop runs a validation check, and only updates the content that has been changed on the server since the previous synchronization. If you want to deactivate the offline sync mode, you need to uncheck the ‘Take Offline’ command in the Favorite folder. 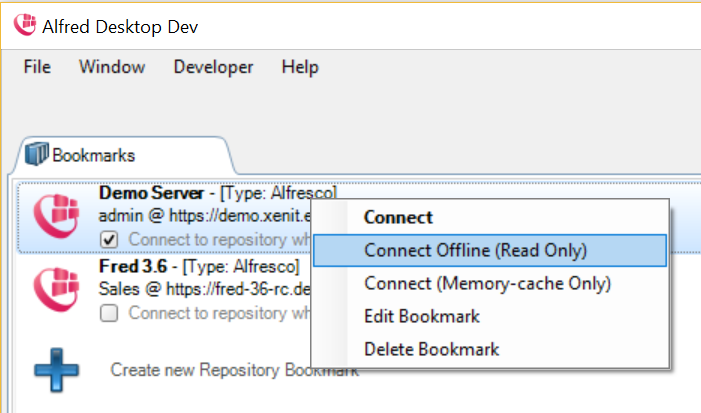 When you are offline, you can connect to the local repository via the Bookmarks menu. First, make sure to disconnect from the network by clicking on File/Disconnect. In the list of repositories, right click the bookmark you want to connect to, and select Connect Offline. When you are connected, you will be able to navigate in the substructure that has been synchronized. Only some of the menu commands will be available whilst you are offline.